"I'm 78, and this was my grandmother's pie. Good served warmed up with whipped cream and a dash of nutmeg on top, or great served cold." Bake pie shell at 400 degrees F (205 degrees C) for 5 minutes. Set aside. Combine melted butter or margarine, sugar, flour, milk, vanilla, and nutmeg. Add beaten eggs, and blend well. Pour filling into partially baked pie shell. Bake at 325 degrees F (165 degrees C) for 45 to 55 minutes, or until an inserted knife comes out clean. Do not overcook. Had a nice taste, easy to make but it is the "solid heavy type pie" not like the more "custard" styles. Less nutmeg if I try it again. 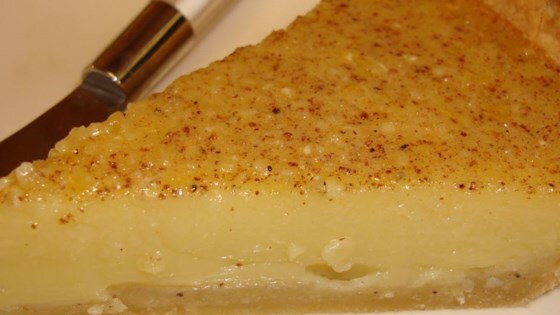 This is absolutely the finest custard pie recipe ever! I have recommended it numerous times. Excellent, Excellent, Excellent! And, to boot, the easiest recipe I have ever found! I thought this pie was delicious! If you are not a big fan of nutmeg, I would only use half. I myself liked the flavor. I used skim milk (since that is all we buy) and it was just fine. HAS NOW BECOME OUR FAMILY FAVORITE. VERY KITCHEN BASIC INGREDIENTS. Way too much nutmeg for my taste. Not what I was expecting for egg custard pie. The pie butter sitting on top. Strange.